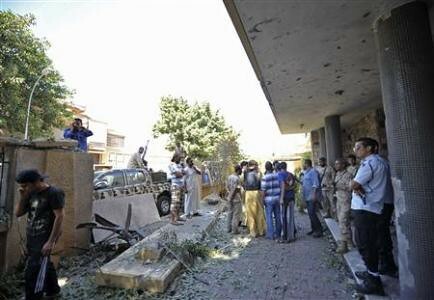 Damage from a car bomb explosion at the Swedish embassy in Benghazi, Libya on October 11, 2013. There was an attempted coup earlier in the week., a photo by Pan-African News Wire File Photos on Flickr. WASHINGTON — The detention of four American military personnel in Libya on Friday was preceded by a confrontation at a checkpoint in which gunshots were fired and a vehicle was damaged, a witness in Libya and an Obama administration official said on Saturday. Details about the confrontation, which occurred about an hour’s drive west from Tripoli, remained unclear on Saturday. The four military personnel, assigned to the United States Embassy in Tripoli, were held for several hours and then released. A spokesman for the United States Africa Command, which oversees military operations in Africa, declined to comment on accounts of the episode in Libya. But an administration official, who declined to be identified, acknowledged that Libyan forces had fired their weapons and that a vehicle driven by two of the Americans appeared to have been damaged. The State Department said on Friday that the four Americans were stopped in western Libya near the historic Roman ruins at Sabratha. The department said they had been involved in “security preparedness efforts,” which other administration officials said involved canvassing potential evacuation routes. The road where they were stopped is not far from the main road to the Tunisian border. In Libya, a witness said in an interview that a car with two Americans ran into a problem at a checkpoint between 8 and 9 p.m. on Friday. According to the witness, who asked not to be named for fear of retaliation, the Americans were reluctant to stop because “they were afraid that it was a fake checkpoint” where they might be robbed or detained. Many checkpoints in Libya are controlled by local militias. Another car with two other Americans proceeded past the checkpoint and was later stopped at a second checkpoint, the witness said. An administration official disputed reports from Libya that the Americans had returned fire. There were conflicting reports about the damage to one of the Americans’ vehicles. Some said that it was set on fire; others said it was disabled in some other way. Administration officials said they were still gathering information about the episode. But the Obama administration’s reluctance to discuss it in detail also appeared to reflect sensitivities about the United States relationship with the Libyan authorities. The confrontation was the latest brush with danger for Americans in Libya, where the security situation has deteriorated significantly since the fall of Col. Muammar el-Qaddafi in 2011. This month, an American teacher was killed in the eastern city of Benghazi. On Sept. 11, 2012, the United States ambassador to Libya and three other Americans were killed in attacks on American outposts in Benghazi. The violence has made it difficult for Americans to move freely throughout the country.